Dissident group tells former members : We’ll kill you too. THE Continuity IRA has admitted it shot Korean McManus dead in front of his 16-year-old brother. The dissident group also issued death threats against former members last night. McManus (26) was the first person murdered by the Continuity IRA since 2009 shooting of Constable Stephen Carroll in Craigavon, Co Armagh. Using a recognisedcodeword, the group said it killed the father-of-one outside a West Belfast pizza takeaway at about 11.20pm last Saturday. A lone gunman got out of a car and called out the delivery driver’s name before blasting him twice in the back with a shotgun. Mr McManus, originally from Turf Lodge, left West Belfast in 2010 for Crumlin, Co An trim, after a samuria-sword attack in which a man almost lost an arm.The Continuity IRA claimed it killed McManus because he was involved in criminality and “terrorising the community with hatchets, knifes and swords “. The group threatened people with death for using its name for “personal gain”. It is understood those threatened had left the oorganization after internal unrest. Among those named were a former Belfast leader of the organization and a member of a well-known West Belfast family. The threats have led to concerns of a potential feud. The group also said that ” any retaliation against its members would be meet with extreme force”. Mr McManus appeared in court charged in connection with a sword attack in Turf Lodge in February 2010. His mother said the family had been assured by police that he was not under a dissident death threat and it was believed the murder was down to a personal vendetta. She also revealed they had fled West Belfast after their home was attacked and said the victim’s car had been destroyed in an arson attack just five weeks ago. Speaking to The Irish News, Sally McManus described the shooting as “cowardly”. “To shoot someone in the back is such a cowardly act. I would like to come face to face with the person who murdered my son,” she said. Mr McManus was a father to a five-year-old son, also called Kieran, was buried on Thursday following Requiem Mass at Holy Trinty Church in West Belfast. Speaking at the funeral, Fr Brendan Smyth called for there to be no retalation. “Revenge or retribution is a nasty word and a road that will lead to added heartache,” he said. “For those of you who may contemplate such a road I beg you don’t.” A 34-year-old man who handed himself in to police earlier this week for questioning about the latest shooting was released without charge on Thursday. 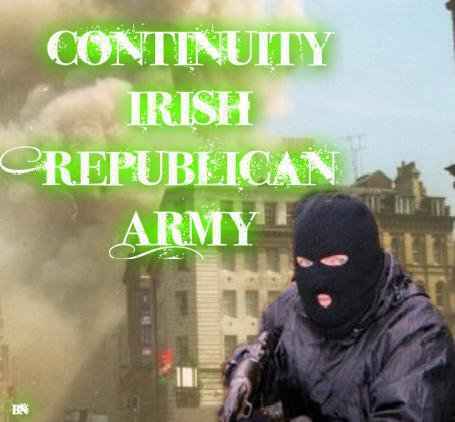 THE Continuity IRA has threatened to kill a number of former members of the organization. The dissident group claims the men have been using the CIRA’s name for “personal gain “. Using a recognised codeword, the organization’s so-called Northern Command last night named a number of individuals who split from it following unrest. The sinister threats have led to concerns of a potential feud. Among those under death threat from the CIRA are a former Belfast leader of the organization who parted ways with it last year. A member of a well-known West Belfast family who had a relative murdered by loyalist paramilitaries is also under threat from the organization, along with an associate who was arrested for extorting money from an alleged drug dealer. A Dublin member of the CIRA who was part of a major split is also under death threat from the group. The CIRA has been involved in a number of splits in recent years with people from Limerick and Belfast leaving the main organization in 2011 amid accusations of criminality among some members. POLICE were questioning five men and a women last night after a ssuspicious object was discovered in Co Atrim. British army bomb-disposal experts examined the object, found in the Barn field Road area of Lisburn. The object was discovered after police arrested two men in Lisburn and three men and a women in Dunmurry. The Barn field Road was closed for several hours but reopened at about 6pm yesterday. With many tthanks to : Allison Morris, Irish News.